Dubai: Middle East chief executives’ confidence level on prospects of revenue growth has taken a drastic decline this year compared to 2018 according to PwC’s CEO survey launched at the World Economic Forum Annual Meeting in Davos. After a significant uptick in optimism last year, Middle East CEOs are more cautious about growth in the region. Only 28 per cent of regional CEOs were ‘very confident’ on revenue growth in the next 12 months compared to 33 per cent last year, and 35 per cent globally. Most strikingly, the proportion of business leaders (43 per cent) that expect their headcount to fall is more than double the global figure (19 per cent). Middle East CEOs, in line with their global peers, are prioritising operational efficiencies to remain fit for growth. The majority (68 per cent) of regional CEOs put operational efficiencies at the top of their list of planned activities to drive profitability in the next 12 months compared with 77 per cent globally. 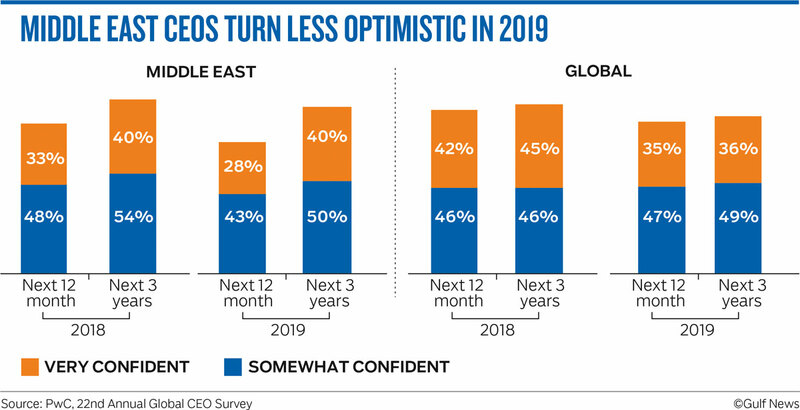 Middle East CEOs are also more pessimistic about the short-term global economic outlook for 2019 compared to their global counterparts with only 28 per cent of the region’s CEOs expecting global growth to improve whereas globally 42 per cent of surveyed CEOs are optimistic. The study observed that the caution among CEOs is to be expected, given that oil prices started to fall again in late 2018, growth in the private sector has stalled in the region and consumer spending is still feeling the impact of job cuts between 2015 and 2017. Yet despite the current uncertainty, the regional CEOs remain slightly more upbeat about their companies’ medium-term prospects compared to global peers. Looking ahead, many regional CEOs are looking closer to home for growth opportunities. Saudi Arabia and Egypt are seen as major regional growth destinations. Egypt also featured more prominently this year as 15 per cent of CEOs cited it as the most important for growth, coming second only to Saudi Arabia (28 per cent) and followed by India (13 per cent) and Iraq (10 per cent) in the rankings. Dubai: The PwC Global CEO survey observed that the Middle East CEOs are grappling with rapidly changing consumer behaviour as the digital revolution takes hold at speed. Middle East CEOs see changing consumer behaviours (79 per cent) and the speed of technological change (75 per cent) as the most significant threats to their organisation. On the impact of artificial intelligence (AI), 91 per cent of Middle East CEOs believe that AI will significantly change how they do business in the next five years, in line with the global results. Although 43 per cent have plans to start introducing AI initiatives in their organisation in the next three years, only 23 per cent of have already introduced AI into their business, half the proportion globally. The study showed data and skills are the two things holding back regional organisations from digital revolution. According to CEOs, Only 13 per cent (compared to 41 per cent amongst global CEOs) believe the quality of their company’s data is adequate for assessing the customers’ preferences and needs. And 61 per cent of regional CEOs cited the lack of analytical talent as the primary reason they do not receive adequate information. “The skills needed to give meaning to data and technology are in high demand. In order to reap the benefits of an investment in digital, companies need to invest and upskill their people. This is important because digital upskilling goes beyond just embedding the technology, it will allow companies to deliver quality and drive growth, securing their future,” said Hani Ashkar, Middle East Senior Partner.